Everyone loves ostriches! It’s just a simple fact. We don’t know why anyone wouldn't love this majestic flightless bird. Personally, they remind us of dinosaurs! Maybe we’re reaching a bit but there are still many other reasons to love ostriches. One right off the top of our heads is that people can ride them and compete in official ostrich races. When you grab this Inflatable Ostrich Costume for your kiddo, he can start his career as a professional ostrich rider! We wouldn’t suggest you go out of your way to find an ostrich farmer in order to get your little one started on this exciting career path. No, it’s all about the baby steps in this profession. If you start him off with a full-grown ostrich right away, the ostrich will sense that your tyke is an amateur and really give him a rough time. You’ve seen what an ornery bull can to do a rodeo cowboy, well just imagine what a dinosaur (kind of) will do to your little rider if given the upper hand. Things could get messy. 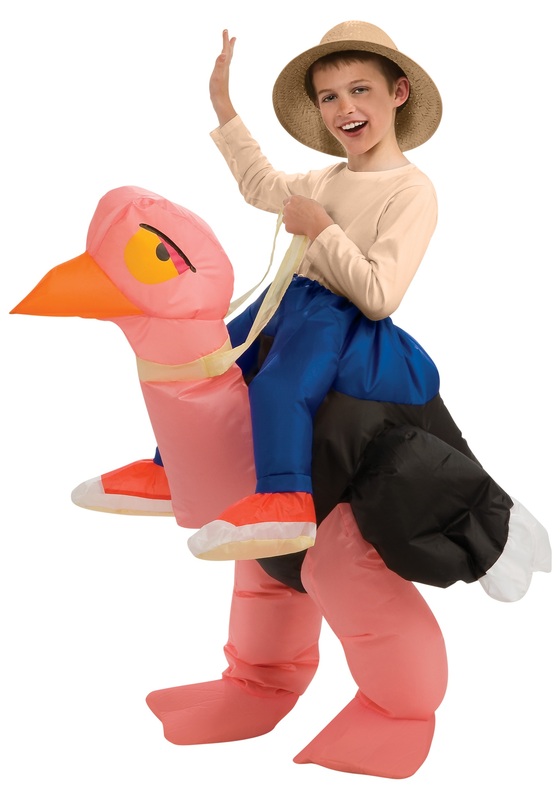 So we suggest you start him off with this inflatable ostrich rider costume. Once he gets the hang of riding, he’ll be the quickest trick-or-treater in the neighborhood. Ostriches are the fastest flightless birds on the earth with the capability of going over 40mph. So needless to say, it shouldn’t take too long for your kiddo to hit all the houses around the block. Before you know it your child will be a master ostrich whisperer and you’ll have your very own ostrich farm! Awesome, right? Imagine the size of the fired-eggs you’ll be having for breakfast!